If you can eat soy oil/lecithin, then your options are greatly increased, however, for those of you who need to avoid soy oil/lecithin, it's a lot harder! So what I recommend is to get yourself a bread machine. Making bread is so incredibly easy if you have one of these appliances, and the bread tastes so good when it's fresh. I was fortunate enough to receive one for Christmas -- thanks, Mom and Dad! -- and I just love my Cuisinart bread maker. It's pretty versatile, and I've been getting a lot of use out of it. If you're wanting to get a bread machine, but don't have the budget for it, consider checking craigslist or put out an SOS to friends and family. I bet someone will be willing to help you out. This is a good, basic recipe to start with in a bread machine. Who doesn't love white bread? My kids gobbled it up. It's fantastic with a drizzle of honey on it! Place the water, sugar and yeast in the pan of the bread machine that has been fitted with a paddle. Let the yeast dissolve and foam for 10 minutes. Add the oil, flour and salt to the yeast. 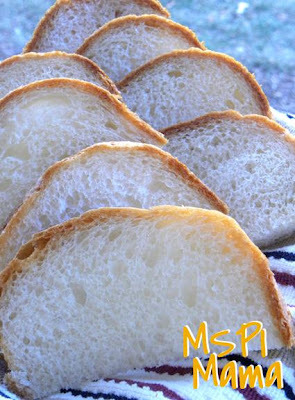 Select Basic or White Bread setting for a 1½-pound loaf and your preference for light, medium or dark crust. Press Start. Once bread has mixed for several minutes, check on the dough and, if needed, scrape down the sides of the pan with a rubber spatula. If the dough appears too dry, add a splash of water. If it appears too wet, add a bit of flour. Allow bread machine to finish mixing, rising and baking cycles. Once finished baking, remove bread from the machine and allow to cool slightly before slicing. Tip: Don't want to use a bread machine? Here are instructions on how to convert bread machine recipes to traditional.